I matted her face with Mr. Super Clear. And let me just say right here there are no other contenders. This stuff is magical. Do whatever you can to get it, it’s worth the trouble. Both HLJ.com & Domuya.com are carrying it. Go. Now! K, after a couple coats of Mr. Super Clear I used pastels to brush on more pink blush and used a little black to darken up the shadow. I painted the lips dark red, and the eyelids black. The eyelids are not as smooth as I would like, but I don’t have an airbrush. Bah. In any case, I think these pictures almost do justice to how much she glows. She is RADIANT. Go matte your velvet minuette’s now. Go. Oh, and whodda thunk I’d get so much use out of an Ikea stool cover ($2.99!) eh? Love that green fur! Oh WOW!!! She looks so fabulous! She kinda has this strange smirk like Audrey Tautou from Amelie. Like she’s got secrets and she’s up to something but she won’t tell you until you find out yourself. Heheheehe. I don’t usually care for Blythe but her– I can do! Oh! That is so cute of you to say. I LOOOOOVE Amelie, so yeah, I can see the smile now that you mention it. Heh. So cool. I love her hair sooo much. 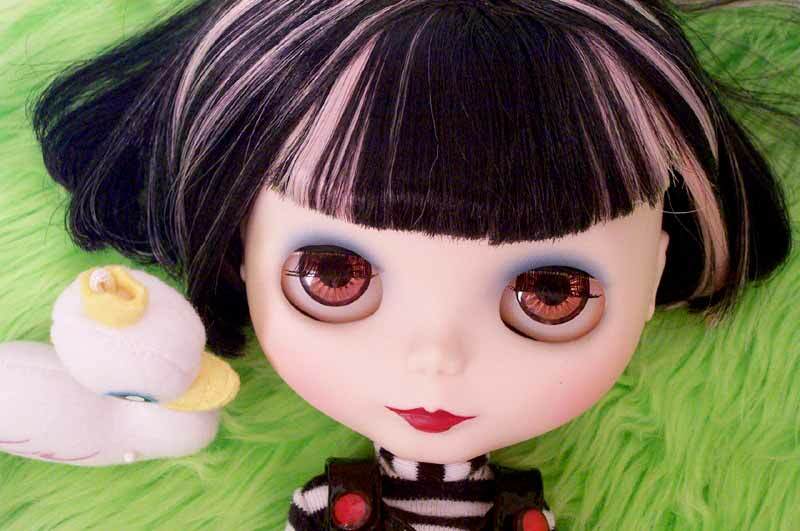 That photo should be shown to anyone who says Blythes are ugly. The way the skin and streaks contrast with the dark hair, beautiful.